The December 1, 2015 episode of Georgia Public Broadcasting’s On Second Thought included a segment on modern Southern women. Here, the program’s host Celeste Headlee discusses stereotypes of Southern women with author Jessica Handler and Armstrong State University professor Regina Bradley. You can listen to the episode here (The part begins at approximately 15 minutes and 55 seconds into the broadcast). This On Second Thought piece prompted us to highlight several partner collections that feature the achievements of modern Georgia women, and the impact that these women have had in the state of Georgia. 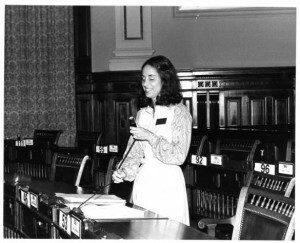 Cathey Steinberg at her seat in the General Assembly, Atlanta, Georgia, circa late 1970s. Local identification number: W042_50_2_014, SERIES III: Visual Materials, Cathey W. Steinberg papers, W042, Donna Novak Coles Georgia Women’s Movement Archives. Special Collections and Archives, Georgia State University, Atlanta. From our partners at Georgia State University Library Special Collections and Archives, the Donna Novak Coles Georgia Women’s Movement Archives documents the second wave of the women’s movement in Georgia, and in particular, efforts in the state to ratify the Equal Rights Amendment. Donna Novak Coles is an activist and philanthropist who has worked with the Feminist Action Alliance, Housewives for the ERA, Georgia Women’s Political Caucus, the League of Women Voters, ERA Georgia. Inc., and the Georgia Women’s Movement Project. Items in this collection include the personal papers and artifacts of individuals active in the 50-plus organizations affiliated with the ERA Georgia Coalition; records of the ERA Georgia Coalition member organizations; personal papers and artifacts from other organizations and supporters of the ERA in Georgia; oral history interviews with ERA and women’s movement activists. Also from our partners at Georgia State University Library Special Collections and Archives, the Terri Wilder Papers, circa 1996-2007, focus on Wilder’s efforts as an advocate for people living with HIV/AIDS. Terri Wilder is a native Georgian activist, HIV/AIDS advocate, and social worker who has worked in HIV patient services for over twenty years. The materials in this collection consist primarily of educational literature produced by organizations with which Wilder has worked, such as ACT-UP, the Global Campaign for Microbicides, and the Hope Clinic at Emory University. From our partners at the Atlanta History Center, we have two oral history interviews with Dorothy Bolden, available here and here that were conducted by Bernard West on December 7, 1978 as part of the Living Atlanta Oral History Project Collection. Bolden, an African American domestic worker, founded the National Domestic Workers Union in 1968. 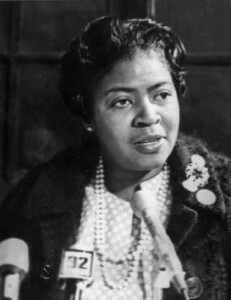 She also served as vice-president of the Black Women’s Coalition of Atlanta, and worked for both the state and national Departments of Labor. 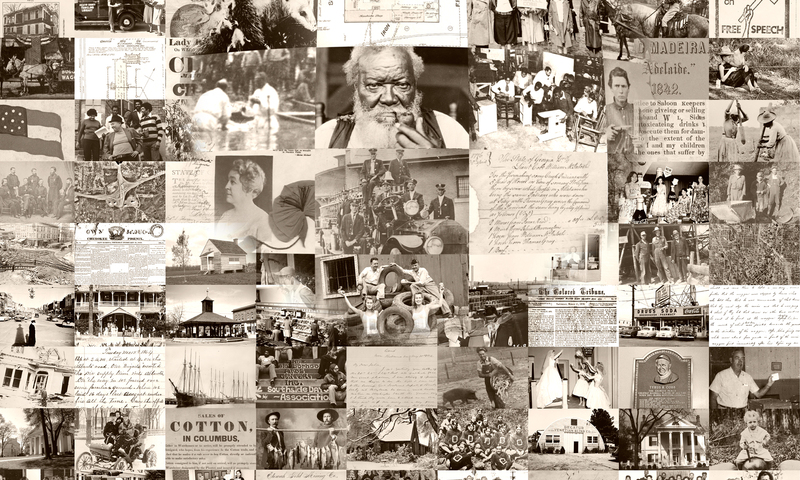 Numerous photographs of Bolden are also available in the Southern Labor Archives, Special Collections and Archives, Georgia State University. L1979-24_75, National Domestic Workers Union (U.S.) Records, Southern Labor Archives, Special Collections and Archives, Georgia State University, Atlanta. And from our partners at the Richard B. Russell Library, the Reflections on Georgia Politics Oral History Collection contains oral history interviews conducted with modern first ladies of Georgia, including Marie Barnes, who discusses her work with the Georgia Early Learning Initiative and her work with women’s health issues, and Shirley Miller, who discusses her goal to promote adult literacy in the state through the Certified Literate Community Program. Please take a look through these resources, and see what modern Southern women have done in Georgia!